Help Support the Bird House, Hospice Home of Johnson County! Download and bring this flyer to Stuff Etc Iowa City, Coralville, or Cedar Rapids March 1st-3rd and 10% of your pre-tax purchase will benefit The Bird House! Stuff/Bird House Voucher Only one coupon per person, per visit! Please share with your friends! Please refer to "The Latest News" box or our Facebook page for other holidays and weather closing information. Download and bring this flyer to Stuff Etc Iowa City, Coralville, or Cedar Rapids March 1st-3rd and 10% of your pre-tax purchase will benefit The Bird House! Only one coupon per person, per visit! Corridor Radiology Now Offers DEXA for Body Composition Testing! Go to the Bone Densitometry page or call 319-545-7300 for more information! 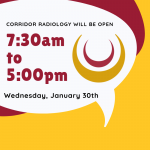 Corridor Radiology will be open from 7:30am to 5:00pm on Wednesday, January 30th. Corridor Radiology has changed hours of operation. Corridor Radiology is now collecting payment the day of service. If you would like an estimate of what your payment will be call us at 319-545-7300 and speak with one of our friendly team members. It doesn’t matter if your referring provider is from UIHC, Mercy, UnityPoint, Genesis, or a different hospital system we accept patients from any medical facility! Corridor Radiology has ways to get your images to each provider through channels such as our Referring Physician Portal (MRP), LifeImage, or simply sending a disk with your images which is easily uploaded into their system. If your provider says they cannot send you to Corridor Radiology they may not know that our services are available to them! You have the freedom to choose where you have your radiology exams performed and hope that you choose Corridor Radiology. Call us at 319-545-7300 if you have questions and encourage your provider to do the same! PRIOR AUTHORIZATION HELP IS AVAILABLE! Are you in need of prior authorization assistance? Please call 319-545-7300 and ask for Lisa! A prior authorization assistance form is located under the referring physicians tab for download. Change Your World! Apply Today! Corridor Radiology is currently seeking a candidate for a friendly care giver to join our team! Click on the careers tab for more information. Online bill pay and enroll in e-statements is now available! Thank you for your patience! Our online bill pay and enroll to receive e-statement options are are currently down. We apologize for the inconvenience! If you would like to make a payment please feel free to give us a call at 319-545-7300.